If you are in the NJ area, we are available for installations. Please contact me for more details. Roman shades can be mounted inside your window casing or outside, on the wall or trim. It is really all your preference but sometimes the window won't allow for one style or the other. For an inside mounted shade, the depth of the trim to the glass should be at least 1 1/2" or it may stick out too much. Inside mounted shades are nice if you'd like to display your trim and provides a nice clean look. The top board is orientated so that the 1 1/2" part of the wood is facing the ceiling and floor. Outside mounted shades are a good option if you have old trim or no trim at all, or if your window is small and you want to expand the area a little bit. Outside mounted shades are orientated so that the 3/4" part of the top wood is facing the ceiling and floor, so the depth of the shade is about 5/8". Please click here to view how to measure properly. Use 2 L brackets and 8 screws per shade. First, put the shade on the floor or a flat surface so that the cord lock and eye lit screws are facing upward, 2” part of the wood flat on the floor and the white liner facing you. Drill 2 screws into the board directly above the cord lock and in the same position on the other side. Make sure the part of the bracket that goes into the trim/casing is flush with the ends of the top wood. Put the shades fully down and hold them up to where you want them to mount. Make sure the bottom is sitting even across on the sill. Drill 2 screws into the inside of the casing. When you raise and lower the shade you may need to adjust each string to make the pleats level. Each string controls a different part of the shade. Do not tie off the strings above the knob because the child proof condensor knob will not work properly. You should always tie off the cords up hight if you have children or pets around. You may also tuck them behind a pleat for a neater look. Hold to hold inside mounted shades, preparing for installation. Cords and Screw eyes are always pointing downward. Use 2 flat brackets and 4 screws per shade. Start with the shades fully down and hold them up to where you want them to mount. For outside mounted shades, make a pencil mark on each top corner once you get it level. Inside mounted shades should be flush on top, inside the casing. Put the shade on a table or flat surface with 2” part of the board on the ground and the white liner facing you. Hold the bracket so the bottom hold is directly under the board and fully exposed. The bracket should be positioned about 1-2” in from the edge on each side. Next, drill one screw into the top hold and into the wood. Do the same on the other side. Next, have someone else hold the shade up so that it is even, and drill a screw through the bottom hole and into your trim or wall. You may use a level on top of the wood to be sure it’s level. Drill Bracket into Frame or Wall In Desired Position. You may with to install with 2 people and use pencil marks and a level to mark where screw should go. How to hold outside mounted shades, preparing for installation. Cords and screw eyes are always pointing downward. 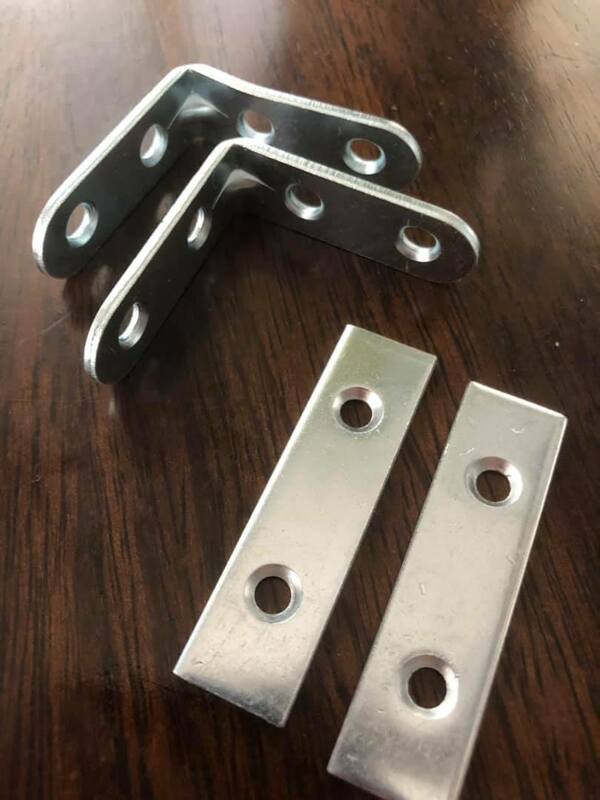 You may purchase L brackets from your hardware store OR just use the provided screws and drill directly into the board and into the top of the inside of window frame. We used to provide L brackets for hanging but we’ve found that simply drilling the long screws directly into the board, eliminating the brackets, is much easier and it looks much nicer too bc there is no hardware showing. Installation is always easiest with 2 people. Step 1: Hold your shade into position inside the window with the fabric let down all the way, and the cord lock facing downward. Be sure the sizing seems ok before drilling. The front of the top board should be as flush as possible with the top of the window trim so it does not project out of the window casing. Take note of where you will drill the 2 screws into the top/inside of the window. Step 2: On a flat surface, liner side up, pre drill where the X marks are on the shade. They should be on the same side of the board as the cord lock and screw eyes. This screw placement is not set in stone and can be adjusted, if needed. Please be sure the shade fabric is not bunched up underneath when drilling and you are just drilling into the side with the cord lock and out the other side of the top of the board. We recommend pre drilling so the fabric does not pull when drilling. If you do not wish to pre drill, please drill the screw very carefully and be sure the fabric is not pulling. Drill the screws into the board and partially through the other side of the board so that the screw is popping out slightly through top of board. Do this on both sides of the shade. If the shade is wide, you may wish to put a screw in the middle of the board for additional support. Step 3: Position yourself under the shade with the fabric all the way down. Hold the shade into the window, as flush as possible with front of moulding and drill up into the top of the window on both sides. You may purchase 2” flat brackets from your hardware store OR just use the provided screws and drill directly into the board and into the top of the inside of window frame. We used to provide brackets for hanging but we’ve found that simply drilling the long screws directly into the board, eliminating the brackets, is much easier and it looks much nicer too bc there is no hardware showing, especially for outside mounted shades. Installation is always easiest with 2 people. Step 1: Hold shade up to the window with the pleats let down all the way, so the bottom of the shade brushes against the window sill straight across. Step 2: Put a level on the top of the board to be sure it is straight and then mark 2 pencil lines right above the board where you will position the board for drilling. Take note of where you will want to drill into the window trim/wall. Measure to be sure the lines are even on both sides. Step 3: Put the shade on a flat surface, liner side up, and pre drill on the X mark. You will find this mark if you lift up the board, on the flip side of the screw eyes/cord lock. You can also adjust this mark if you need to, depending on where you want to drill into the trim/wall. We recommend pre drilling so the fabric does not pull when drilling. If you do not wish to pre drill, please drill the screw very slowly and be sure the fabric is not pulling. Drill the screws into the board and partially through the other side of the board so that the screw is popping out slightly through the back of the board. Do this on the right and left. If the shade is wide, you may wish to put a screw in the middle of the board for additional support. **IMPORTANT** never drill through to the front side of the shade. The screw should pop out on the back of the board only. Step 4: Hold the shade up to the pencil marks with the fabric all the way down. Position yourself underneath the shade and drill both screws into the trim/wall. You may wish to use a level to be sure it is level and adjust if needed. All blackout shades should come with strips of some blackout tape on the back side to cover up any pin holes. If any happens to come off please let us know so we can send you more. Or we can advise you where it can be purchased.